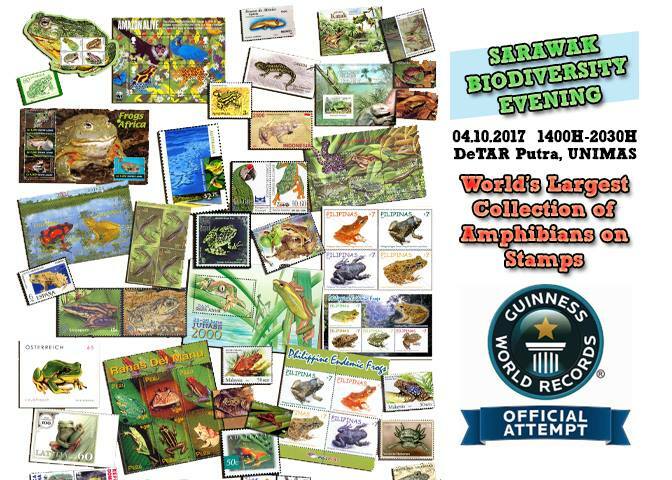 Amphibians, Biodiversity, Campus, DeTAR, Exhibits, Free Entry and Guinness World Records: That sums it up for what will be an exciting evening in Universiti Malaysia Sarawak (UNIMAS) on 04 October 2017. 04 October 2017 is the World Animal Day. In conjunction with this day, the Institute of Biodiversity and Environmental Conservation (IBEC), UNIMAS, is organising the Sarawak Biodiversity Evening of events for public awareness in the fields of environment, ecotourism, nature conservation and biodiversity studies. The evening will showcase exhibitions, workshops, rapid talks, food trucks and philately! The event will run from 2:00 pm to 8:30 pm at the Delima Hall, DeTar Putra Building, UNIMAS. It is open to all and entrance is free. Registration for workshops starts at 01:30 pm. The philatelic highlight will be an attempt to be included in the Guinness World Records as the largest collection of amphibian stamps! Here is the extract: “Under the auspices of Guinness World Records, the organising committee has registered for an official exhibition of the world’s largest collection of stamps on the theme of amphibians (official entry 161123094024tlco). The exhibition will show nearly 1,500 stamps of frogs, toads, salamanders, newts and caecilians, issued by scores of countries around the world, as well as postal stationery and other philatelic materials.” Keen to witness history in the making? Why not drop by for over 450 frames of amphibian postage stamps and postal stationery (including aerogrammes, first day covers, booklets, maximum cards, pictorial cancellations, essays, proofs, unissued items, etc)! myfdc would like to thank Dr Indraneil Das and the Institute of Biodiversity and Environmental Conservation for the insights to the Sarawak Biodiversity Evening and amphibian exhibition. Wishing the event a great success and hope to read about the successful entry into the Guinness World Records!